Beautiful flowers, right? I can't stand looking at them! 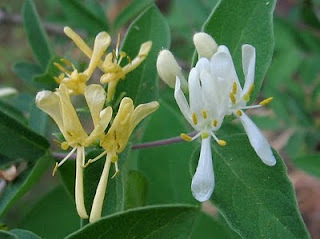 I spent some more time today pulling honeysuckle out of the wooded area in our front yard, where they are smoothering the shrubs and strangling small saplings. The good news was that now that the drought is over, the soil is much softer and it's a lot easier to pull them out by the roots. I felt like I really made some progress today! I just read an interesting article about the correlation between plant diversity and bees' immune systems. Bees that forage from several plant species, rather than a monoculture, can protect themselves better from disease. It's an interesting thought that by gardening and growing lots of nectar plants (without pesticides), perhaps we are ensuring our city bees are in better health than their country cousins. I've become very addicted to my iPhone lately. Countless hours in the dark spent trying to put a baby to sleep were much more interesting when I could check email and look at facebook. And now I can blog from my phone, too! Hurray! You can search by ingredient, including that veggie you grew too much of. More detailed hourly reports help you figure out when to water and when to let nature do the watering. I've spent way too much money on plant books since I started having a mobile wishlist.